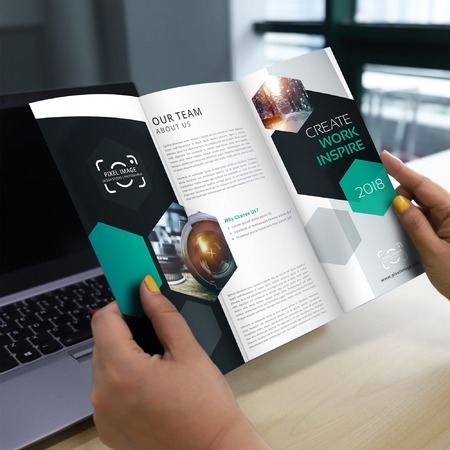 Brochure printing is part of every successful marketing campaign. Give away brochures at a convention, highlight details about your new collection, or include them with every new customer purchase. They are an effective, versatile, and affordable promotional tool. You need a fold that complements your brand and brochure design. Choose from our 10 available brochure folding formats. As its name indicates, this brochure contains two panels with enough space for lengthy text or large images. Choose from the following three-panel folding options: the trifold or letter fold, the z-fold, and the gate fold. The trifold is folded twice to create three panels for a short, visual, and informative brochure. This commonly used brochure has six printed pages on both sides. The gate fold works best on brochure designs with a central image or several visual elements. This brochure fold forms a zig zag pattern. This fold is similar to the gate fold, but has two extra panels. This fold is folded equally in half then folded again in the same direction. The French fold is folded in half horizontally and then vertically folded in half to create the four equally sized panels. Roll fold is folded three times from right to left. Each panel is directed to fold toward the left. We print brochures for you on three premium paper coating options. Glossy paper is vibrant, while the matte’s smooth surface is elegantly subdued. All brochures printed on paper stock and 10 pt. cardstock are folded before printing. You can upload a ready-made design or create your own brochure with our design tool. Make a new design today and have the order shipped anywhere in the US. Start brochure printing for your marketing needs today. Are the sizes shown folded or unfolded? All sizes shown on the calculator measure the brochure when unfolded and laid out flat on a surface. This means that if you want a finished trifold brochure that folds to 9.5” x 3.69”, the unfolded size would be 9.5” x 11”. What should be inside my brochure? 1. Cover - A central image that immediately conveys what your product or service has to offer. Include your company logo and name so customers make the association. 2. High Resolution Images - Use 350 dpi resolution images on your brochure design. This resolution ensures the photo won’t be blurry upon printing. 3. Features and Benefits - The copy should elaborate on the main selling points of your product or service. Break it down in a list format or several sections for easy reading. 3. Call to Action - Include discount coupons or promos in the brochure to drive traffic to your store or online e-commerce site. 5. Contact Information - Don’t forget to place all your company’s contact information, such as a telephone number, address, email address, and website for the customer’s reference. How much copy and images should I include on my brochure? The most eye-catching brochures are highly visual and use images to guide the reader through the content. A photo or illustration in each panel helps introduce or show the content in detail. Copy should be as short as possible and sustain the reader’s focus on your main topic. For more information, check out our guide on how to design brochures. What does the number in the paper material name indicate? The number before the paper and cardstock material indicates its weight. This means that 70 lb. paper is the thinnest and lightest, while 100 lb. is the thickest among the paper options. The 10 pt. cardstock is also lightweight but still slightly thicker than the paper stock materials. Brochures are practical marketing tools used to promote your information-heavy campaigns. Design is essential for attracting your customers while content persuades them to go forward into buying.